Great idea! 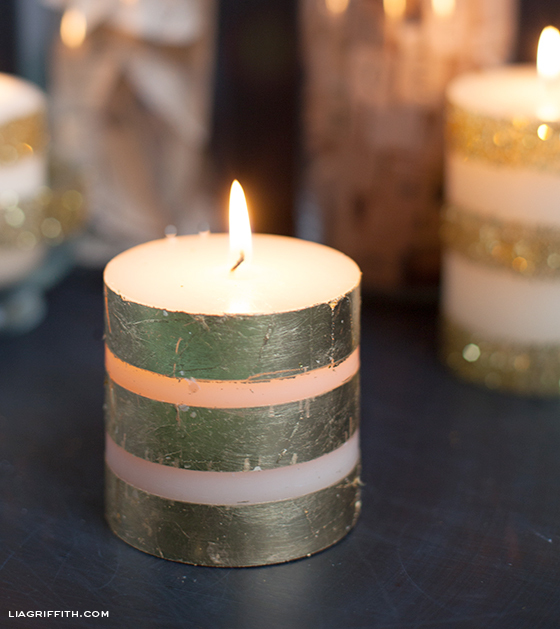 Gorgeous candles!! 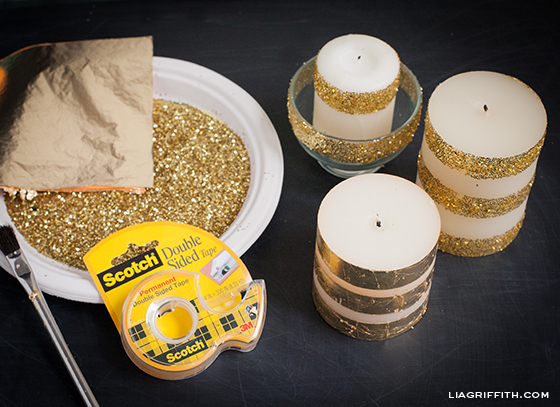 But doesn’t the tape give a strong smell if it melts when u burn the candle? Thx!! Thanks Lara! This may be an issue for candles that burn evenly, but these Ikea candles tend to burn in a tunnel so it works great for this brand. 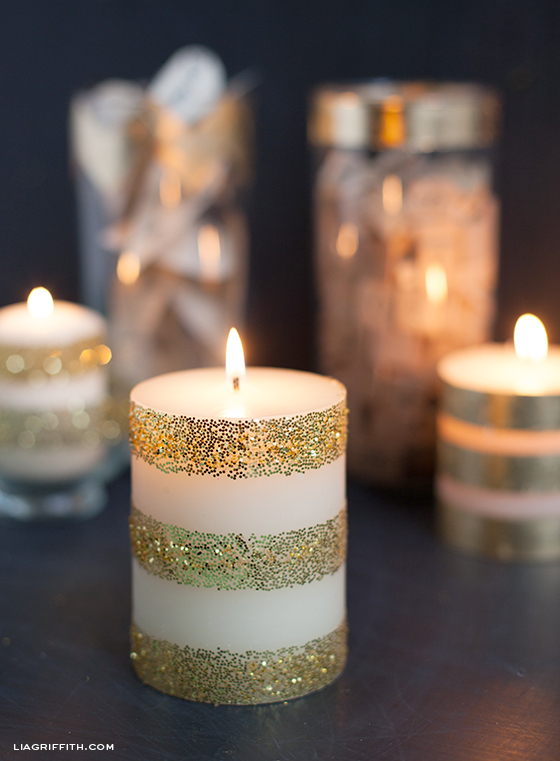 These dressed-up decorative candles will definitely bring sparkle to your table (literally) with very little effort. Just awesome….!!! Thanks for this lovely and easy idea. I need to look for the tape to use. I had no idea Scotch brand made double sided tape. Happy you like it. Scotch brand or any double tape brand will work. Wow great idea for Christmas gifts!! I can even do that with my daughter!! thanks Lia!! Do you get any sleep? Seems like you’re making gorgeous projects all the time. I love your candles, hearts, all of it. So pretty. I love the kind of informal glitz you do. As soon as I saw your little hearts I had to make some. Went to find a piece of music. 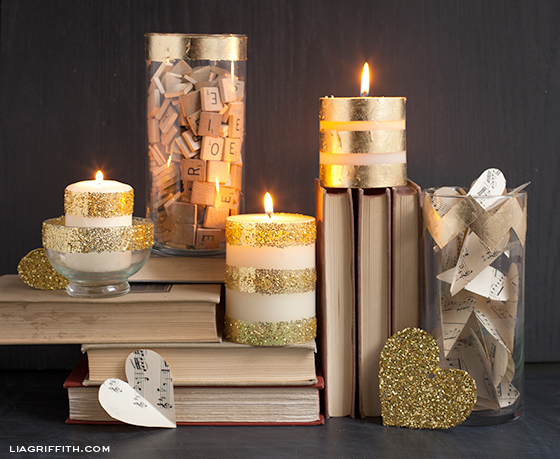 Did you use heavier paper to make the hearts and the glittered heart? Thought I’d make some of the little hearts with card stock. I try to make sure I have plenty of it. Living out away from town makes it necessary to stock up when I can so if I see something I want to make I can get to it right away. Hate to have to wait til I can go into G.J. Love how the little hearts look in that glass container. I decorated some shorter round containers I’d gotten at a thrift store, 3 different sizes. I used a dauber to make dots on them in different colors of metallic paints, sprinkled some glitter on some of dots. I’ve yet to try the faux mercury glass, have the paint. We have so much wind out where we live it’s hard to find a good day to spray paint. No basement or garage to paint in. Have you done any faux mercury painting? I was getting kind of a crafting block but since I found your blog you’ve re-inspired me. Haha! I do but once awake I am on GO. I always feel like I am in catch up mode, to be honest. It helps to have my posts from my previous blog that I can pull from, but I am almost out of those. Oh dear. I did use a card stock for the glitter hearts, but something like a thin foam core works even better. These class cylinders were from thrift too. They come in handy for storing craft supplies and now decorated have been moved into my main house. I have not tried faux mercury but it sounds like something I shall put on my list. I love the look. So happy you are crafting along with me. Yay! !